Want To Know Anything About The 2016 Mitsubishi Outlander Sport Or Nah? 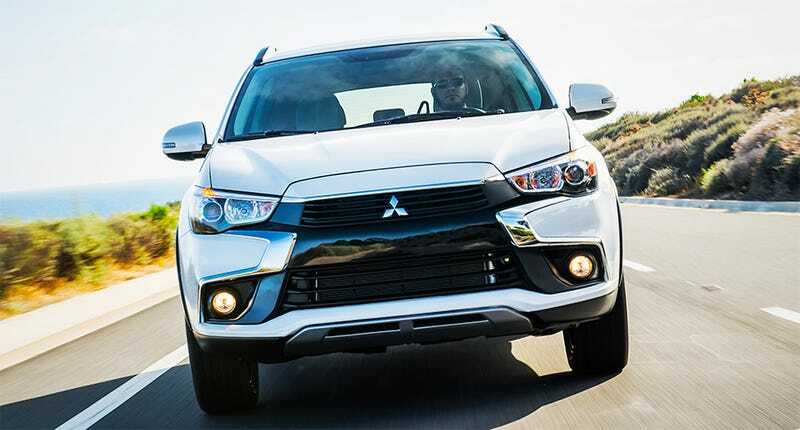 It looks like 2016 will be the last year of the Mitsubishi Outlander Sport; a compact SUV with an aggressive look, nice paddle shifters and wheezy little engine. I’m driving one all week and I actually like it more than I thought I might. Give me some questions so I know what to look for! Or don’t, I guess. If you’re not interested in this one I won’t take it personally. But if you are, so far I’ve put about 20 miles on the range-topping GT trim, with a beautiful panoramic sunroof, mood lighting, a banging Rockford Fosgate stereo and selectable AWD. The things I just mentioned are pretty good. So are the ergonomics, visibility and believe it or not, the fake “shifts” you can manually activate on the CVT. Two big, satisfying paddles fixed to the steering column bump you between simulated gears. It defies all logic, but the experience is actually kind of fun. More on that later. As for the engine, so far I’ve only been able to make the the 2.4-liter produce glacial acceleration and cacophonous racket. But hey, maybe it will turn out decent fuel economy. Anyway I’ll go ahead and let you get your questions in before I spoil everything. Fire away!